Today we’re going to go over a huge craze in the financial market: cryptocurrency. You’ve probably heard of Bitcoin, one of the biggest names in cryptocurrency at the time of recording. People have been swearing by it or swearing AT it all over social media. So what makes this new financial market so polarizing for investors? 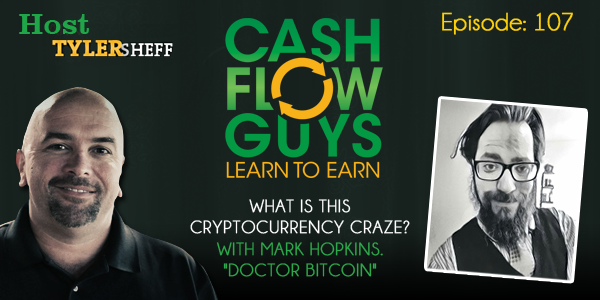 We’ve got one of the biggest names in cryptocurrency, Mark Hopkins, aka Doctor Bitcoin, here to talk to us about it. Mark has been working in the Bitcoin field since 2011, just a few years after Bitcoin was born. The name Doctor Bitcoin was a nickname Mark picked up as the founder and editor-in-chief of Silicon Angle, an online financial blog. Mark wanted to write articles about Bitcoin and crypto block chain as an emerging technology. He threw out the name as a joke but his team loved it, and it stuck over the years. Besides Bitcoin, there’s also Ethereum and Litecoin in the market. These are all based on “block chain”, which is an internet protocol that eliminates the requirement for trust between counterparties. It’s a protocol just like email or HTTP and functions like a database or a ledger. The goal is that if you trust the algorithm, you don’t need to trust the people using it; trusting the machine rather than the person on the other side. This way you can transact with anyone without fear. But how do you protect yourself against fraud? With Bitcoin, there is a financial incentive for hundreds of thousands of individuals to apply their hardware to the block chain protocol. If one person is in disagreement, either that person will fork and others follow, or they’ll be thrown out completely. This means there is a financial disincentive to trying to mess with the code. For all my listeners who have never delved into the realm of cryptocurrency, you can get started at WeUseCoins.com. At that site there is a 90 second video that gives you a great overview of Bitcoin, mining, and how the ledger works. Another great resource is Reddit, with hundreds of posts in multiple forums, along with Bitcoin Magazine, Coindesk, and Coin Telegraph publications. Visit Mark at AskDoctorBitcoin.com for more answers to your cryptocurrency questions and his comprehensive guides on how to get started. Don’t forget to check out our 10 week group coaching program, “The Mailbox Money Mastermind”, which will take you from 0 to Cash flow in less than 3 months! Join us at CashFlowGuys.com/MMM. Also make sure to visit us at CashFlowGuys.com to see what we’re doing now!